The “EosAutoShooter” program automatically triggers a CANON EOS camera on motion in the viewfinder. So finally there’s “motion detection” for the EOS Rebel line and other DSLR! EosAutoShooter can be used as replacement for photo traps. If you use a telephoto lens, it works also over great distances. This is important for animal photographers, surveillance tasks and scientific applications. The Canon software “EOS Utility" in its "Remote Live View" mode serves as interface to the camera. After you start EOS Utility in "Remote Live View" mode "EosAutoShooter" begins to display the Live View picture and monitors it for changes. EosAutoShooter functions like an “operator” for “EOS Utility”. EosAutoShooter is a program for MS-Windows operating systems only. It’s written in CodeGear Delphi. Every program running under MS-Windows can be monitored for motion. This can be the Live View picture of a camera, or any other application. “EOS Utility” is predefined as application. For older EOS camera without Live View you will monitor the display of separate webcam to trigger your EOS. An arbitrary area of the Live View picture can be marked for motion detection. So uninteresting parts of the picture can be masked out. 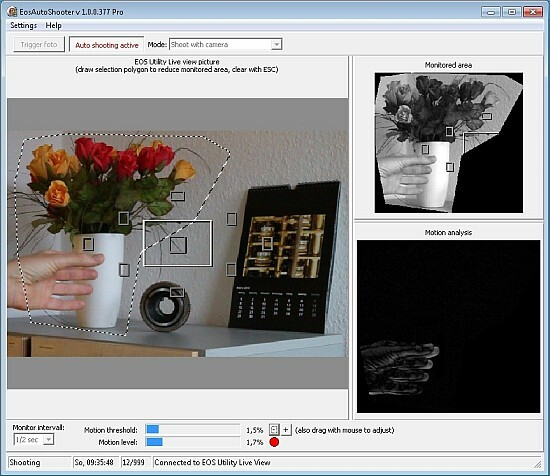 Three preview images display the Live View picture, the motion detection area and the motion analysis. Their size can be adjusted. The sample rate for monitoring is freely adjustable. The level of recognized motion is displayed. Intelligent motion detection: If an moving object leaves the Live View picture and the motionless background image is visible again, then no photo is triggered..
Changes of overall brightness in the Live View picture are suppressed and not interpreted as “motion”. The intervall, for which the trigger button is “pressed down” is adjustable. So if the camera is set for continuous shooting this controls the count of photos. After exposure further motion detection can be suppresed for another adjustable delay. The Live View picture can also be saved to disk. Instead of triggering a photo motion can also start recording of a movie. Photos or movies can also be triggered manually. This can be used as a system test. The number of automatically triggered photos is limited by an adjustable amount. This protects your camera against wear if you run EosAutoShooter unattended. EosAutoShooter is now in version 1.1.0 vor. Many thanks to the members of www.dslr-forum.de! Download and purchasing - how to get it. Quick guide - a quick path to get started. Installation - describes, how EosAutoShooter and EOS Utility are put into operation. Motion detection - describes details and possible settings of the “motion detection” subsystem.. Triggering photos - describes details and possible settings of the “trigger-the-camera” subsystem. Recording Movies - describes, how to record a movie on detected motion. Troubleshootig - lists some known error sources and their correction. In this documentation only teamwork with EOS Utility is described.